Most of the Bath for Europe contingent. Photo © Clive Dellard. 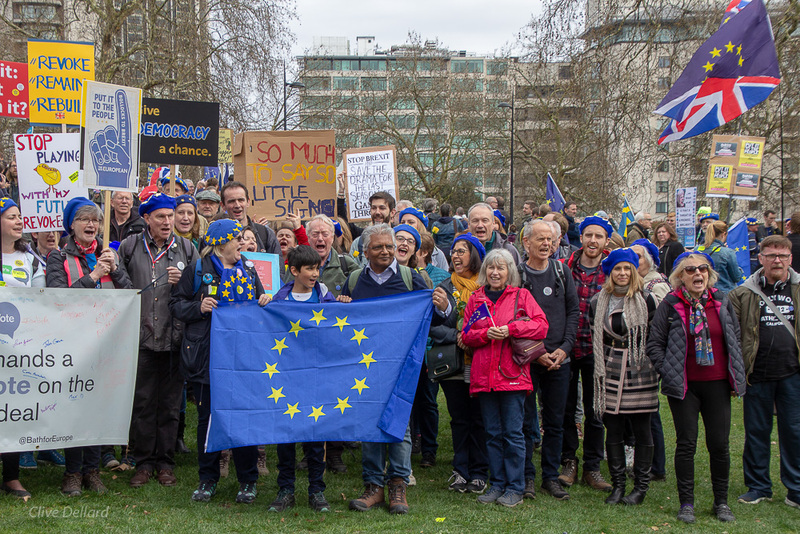 Bath for Europe was strongly represented at the largest UK march in recent history on Saturday 23rdMarch in London. Total numbers on the march are estimated at well over 1 million people. At least 200 coaches were organised by groups like Bath from across the country. Bath sent seven coaches and organised the People’s Vote Express. The special train brought over 600 supporters from Bristol, Bath and Chippenham. Many members of the group made their way to the capital under their own steam. 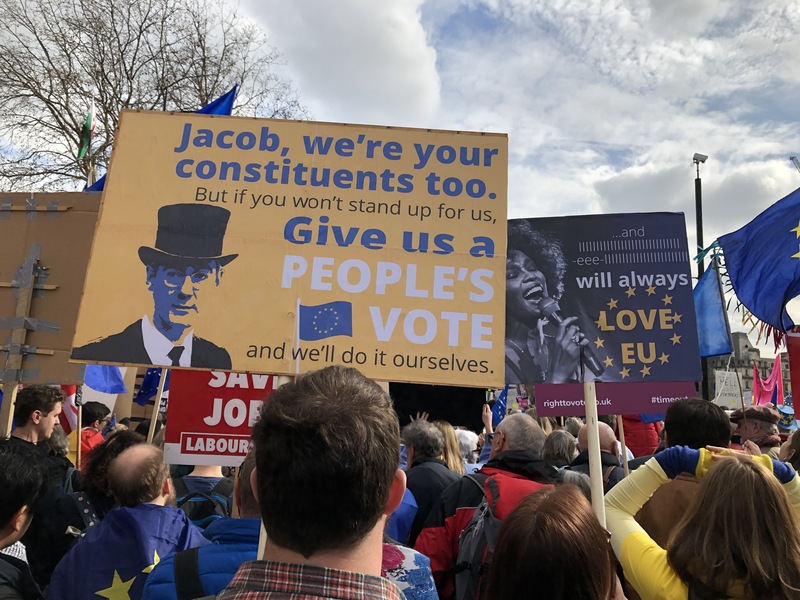 Among the marchers on the People’s Vote Express were Bath MP Wera Hobhouse (Liberal Democrat) and Molly Scott Cato, MEP for the South West and Gibraltar (Green Party). Train registration at Bath Spa station. Photo © Clive Dellard. People of all ages took part, from families with young children to university students and seniors. Many overcame difficulties to be there or marched for the first time because they felt so strongly about the campaign and wanted to show their support. Bath for Europe was grateful to receive donations to enable those who could not otherwise afford it to take part. Marchers started to converge on Bath Spa train station soon after 7:30 am. The animated, upbeat crowd thronged the platform and cheered as the People’s Vote Express arrived at the station. 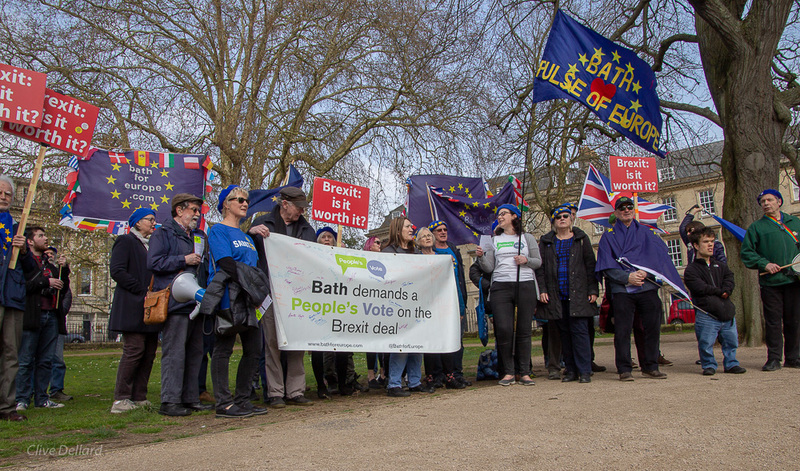 Bath Live was on hand to start its coverage of Bath for Europe’s involvement in the march. Once in London, those who travelled by train headed for the Achilles Statue in Hyde Park where they waited for those coming by coach. Marchers from groups from all over the UK – including those from Cornwall, Scotland, Devizes, Bristol and Swindon (who created the giant yellow star which was picked up in aerial footage) – mingled in the good-natured crowd. Fantastic supporter turnout! Photo © Clive Dellard. Due to the huge turnout, the march was a slow, massive river of peaceful protestors that made its way from Park Lane via Piccadilly and Pall Mall to Parliament Square for speeches by senior politicians and leading activists. Marchers carried colourful flags, banners and placards pointing out the folly of Brexit. The march took place at a very critical moment as the UK is scheduled to leave the European Union on Friday 29thMarch. Two days before the march, a petition to revoke Article 50 was launched which, at the time of writing, has been signed by over 5.5 million people. Those who voted Remain feel their views have been overlooked since the Referendum. One of countless placards on the march. Photo © Clive Dellard.